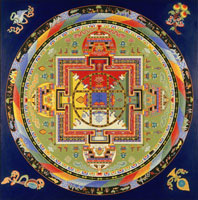 An initiation is a part of the practice of tantra, which Lama Yeshe describes in the free book, Essence of Tibetan Buddhism. In an initiation, a qualified Vajrayana teacher empowers a student to undertake certain practices. In order to read books describing such practices, one needs to have received initiation into the particular tantric deity concerned. In the case of Lama Zopa Rinpoche's Teachings about Heruka and Yamantaka, Rinpoche has requested that they be provided to initiates into those specific practices only. 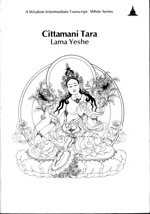 For more detailed information, see Lama Yeshe's book, Introduction to Tantra, Wisdom Publications, 1987. Thank you so much for your interest in this profound path. If you would like any of these books or commentaries, please complete the Initiates Only Materials Request Form. During the spring of 1997, Lama Zopa Rinpoche gave a series of talks at Vajrapani Retreat Center to a group of students who hold the full Yamantaka initiation. He addressed subjects that were specific to this Highest Yoga Tantra practice as well as other, more general topics. 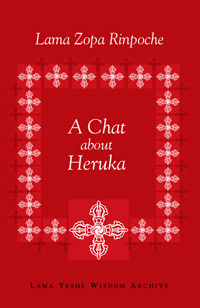 This book is sold out, but the text is now available to initiates as a pdf file. During the spring of 1997, Lama Zopa Rinpoche gave a series of talks at Vajrapani Retreat Center to a group of students who held the full Heruka initiation. He addressed subjects that were specific to this Highest Yoga Tantra practice as well as other, more general topics. This book is sold out, but the text is now available to initiates as a pdf. 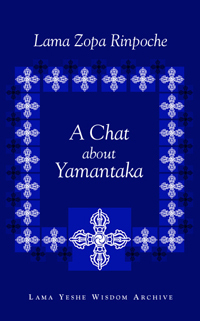 A commentary for retreatants on Yamantaka Solitary Hero practice. This publication is available to initiates as a spiral-bound text. A commentary for retreatants on Yamantaka Solitary Hero practice. This publication is available to initiates as a pdf file. 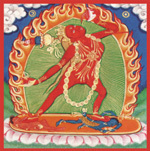 A lightly edited transcript available as a pdf for those with Highest Yoga Tantra initiation in Heruka/Chakrasamvara or Vajrayogini. A lightly edited transcript of a course taught at Kopan Monastery, Nepal in 1979. This is a spiral-bound photocopy of a Wisdom Publications transcript. A lightly edited transcript of a course taught at Kopan Monastery, Nepal, in 1979. This text is now available to initiates as a pdf.